Be sure to Display Images and/or Click a Link. Be a songbird, not a parrot. Happy Fall. Many of you are settled back at school, working away and grading papers. Others of us are lounging around. I hope that all of us are engaged in some poetry activities. I'm clinging to summer but still plan to appreciate the fall foliage and the cooler nights. I'm headed to the Amherst Poetry Festival this weekend where I will lead a workshop on Sunday in the Emily Dickinson Museum, a place I've long wanted to visit. If you happen to be up that way, try to find me and say hello. This month's poem is by Jessica Piazza. It's from her terrific book of inventive sonnets, Interrobang. We are immediately struck by this poem’s unusual title, its one word most likely unfamiliar to many readers. But we recognize the word phobia in it, and Piazza quickly provides a definition for this kind of phobia. She gives the phobia to her speaker, a beautiful woman who hides the ugly girl she once was inside her heart and then inside her fist. When handsome men run from the beautiful woman she now is, the girl in her fist comes out and gets even. Piazza, who describes the sonnet form as “chaos in a box,” uses a variation of the form. She gives us fourteen lines but not in iambic pentameter; instead, we have iambic dimeter: four syllables per line, every second one stressed (u ‘ / u ‘). We have three quatrains and one couplet; however, while there is rhyme, it does not occur in a pattern. There is only one exact end rhyme: trick, unstick, and quick. There are several near rhymes: heart and hurt, first and fist, clutch and punch. Assonance adds to the poem’s music. Notice the use of words with the long i sound: I, inside, sleight, and nights. Notice, too, the use of words with the soft i sound: lives, fist, trick, exit, and in. Notice how the strategic use of a colon in the last line makes us pause and puts a spotlight on punch. Or perhaps you have or know of a phobia for which there is no name. Feel free to invent its name and use the phobia for your poem. Once you’ve chosen your phobia, internalize it, feel it. Be afraid. How might that phobia affect you/your speaker? Then freewrite about your thoughts. Embrace strangeness. Now mine that rough material for your poem. Try the sonnet form of fourteen lines, three quatrains, one couplet. Challenge yourself to work with iambic feet. You might want to use dimeter as Piazza does, but feel free to try trimeter, tetrameter, or pentameter. As you revise, attend to the sounds in your poem. Strive for a bit of end rhyme, some near rhymes, and some assonance. 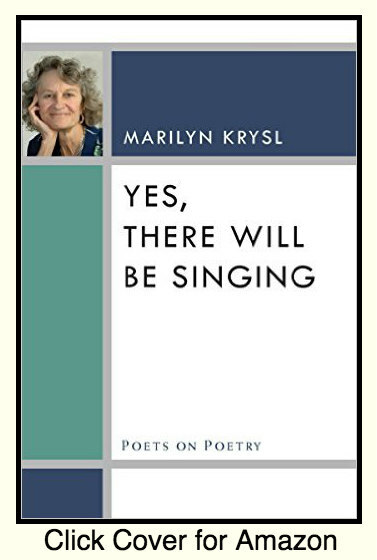 Yes, There Will Be Singing gathers together the essays and reviews that Marilyn Krysl has written during her career as a poet. The pieces are organized into six sections. In section II, there are three pieces on the sestina, the form for which this poet is perhaps best known. We learn here about her introduction to form poetry and how Dylan Thomas’ “Do Not Go Gentle into That Good Night” grabbed her attention while she was still in high school. From the villanelle, she progressed to the sestina. She provides a discussion of the history and virtues of the sestina, illustrating with sample poems from such poets as Patricia Smith. In section III’s essay, “All Hail Litany,” Krysl discusses the interplay between pattern and disobedience in poetry, between sameness and variety. Section IV pays tribute to our poetic forebears: Marianne Moore, Anna Akhmatova, and W.S Merwin. Section V, one of my favorite parts of the book, is “Poetry as a Way of Witnessing.” Here Krysl discusses her evolution as a poet of witness, particularly her semester in Sri Lanka where she recorded the stories of the victims of atrocities. 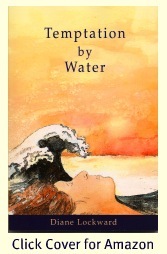 This section also includes reviews of books by other poets of witness: Karen Swenson, Marilyn Hacker, Ingrid Wendt. Section VI, another one of my favorites, is “Poetry and the Healing Arts.” Here Krysl covers her year as poet-in-residence at a medical facility where she observed nurses at work and wrote as she felt moved to write. Another essay discusses her book, Midwife, poems about nurses and caregiving and medical experiences. This section covers her trip to China where she taught for six months and also brings in her trip to Calcutta where she met Mother Teresa and worked as a volunteer. I knew Krysl’s work as a poet and an editor. I am happy now to know her as a poet of commitment to people in dire circumstances and as someone who has used her art to make the world a better place. Lee Ann Roripaugh currently serves as the South Dakota Poet Laureate. She is the author of four volumes of poetry: Dandarians (Milkweed, Editions, 2014), On the Cusp of a Dangerous Year (Southern Illinois University Press, 2009), Year of the Snake (Southern Illinois University Press, 2004), and Beyond Heart Mountain (Penguin, 1999). She was named winner of the Association of Asian American Studies Book Award in Poetry/Prose for 2004, and a 1998 winner of the National Poetry Series. She is currently a Professor of English at the University of South Dakota, where she is Director of Creative Writing and Editor-in-Chief of South Dakota Review. Coming from the Greek word for mask, dramatic monologues, also known as persona poems, draw freely in their craft and technique from the genres of playwriting, fiction, and poetry, making them, to my mind, a hybrid-genre form rich with exciting cross-genre possibilities. Paradoxically, the dramatic monologue, or persona poem, emerges from a tricky welding together of the completely disparate elements of artifice and authenticity. Constructing a first-person character/persona who speaks from the page and engages the reader's imagination in such a way that disbelief is willingly suspended is, in many respects, a tour-de-force of creative artifice. It relies upon creating a compelling and nuanced character that seemingly speaks naturally and “authentically” from a believable scene/setting/narrative circumstance—all of which are artificial illusions created by and through language and voice. Yet when these elements successfully come together, the dramatic monologue is a powerfully resonant form—one that uncannily captures the interior psychological landscape of a character/speaker. In many respects, the dramatic monologist dons the linguistic and psychological mask of their speaker much in the way that a skilled actor prepares for an acting role: Think about Daniel Day Lewis in My Left Foot, being wheel-barrowed about the set throughout the duration of filming, refusing to use any of his limbs other than his left foot. Or think of Canadian actress Tatiana Maslany, in BBC’s Orphan Black chameleon-ing her way through the multiple, diversely distinct characters of the “clone club”—occasionally even engaging in virtuoso acting stunts in which she believably plays one clone impersonating/pretending to be another clone. The dramatic monologue relies upon the fiction writer’s keen sense of characterization, as well as the dramaturge’s flair for framing narrative tension—creating a dramatic moment that not only reveals the nature of the character/speaker, but also provides the narrative scaffolding around which the character speaks, and which may even prompt the character to speak. The dramatic monologue is an intimate form. It reveals the interior life of the character, as held in tension with the exterior, public mask. 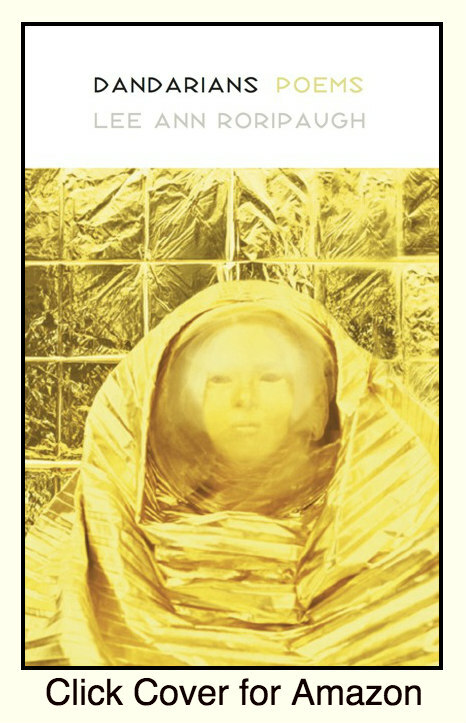 Thus, it is a layering of masks. The writer donning the mask of the speaker of the dramatic monologue, who—as all people do—wears one or more public masks. There is an element of voyeurism in reading/hearing a dramatic monologue—the sense of eavesdropping or spying upon the speaker/character, or secretly reading someone’s personal e-mail. It is a private expression, paradoxically made manifest within the public sphere of the page and/or stage. Strangely, dramatic monologues sometimes become profoundly confessional poems for poets who, behind the protective scrim of the mask, may find themselves revealing something excruciatingly personal about themselves. Like the novelist, or the method actor, the dramatic monologist must learn everything there is to know about their speaker/character, even though only 10%, at most, will likely appear within the frame of the poem. Speaking from this deep reservoir of details, however, allows the dramatic monologist to understand their speaker/character, and to easily and naturally pull from these details on an as-needed basis, as well as understand the psychological underpinnings about what makes the speaker/character perceive, act, respond, obsess, fear, dream, and desire in the way that they do. The dramatic monologue is a poetic form that frequently benefits from intense research. In my experience of writing dramatic monologues, when I’ve researched and processed enough information and details about my speakers/characters, I find that their voices simply start coming to me, one by one—like tapping into a wi-fi signal. The craft elements of voice and tone are crucial to creating the linguistic and psychological mask of a dramatic monologue. Voice involves the diction of a particular speaker/character: their word choice, vocabulary, dialect (the special idiom of a specific locality or class), slang, colloquialisms, etc. Tone, however, is the revelation of a speaker/character’s attitude and/or emotional climate, which is fluid, and can shift during the course of a monologue. Tone is subtle, and draws upon the fiction writer’s toolkit of narrative reliability and dialogic subtext. Tone is the magic by which speaker/characters might unconsciously reveal something significant about themselves to the audience—not through the actual words of what they are saying, but how they say it (or don’t say it) through the tonal undercurrents. For me, the monologue has been a particularly powerful form that I’ve found useful for poems of social activism: poems which privilege the recuperation of potentially silenced voices in lieu of linguistic dexterity or poetic image-making. Drawing upon my Japanese heritage, I’ve written monologues in the fictional voices of Japanese-American internees relocated to Heart Mountain Relocation Camp in Wyoming during World War II, a Hiroshima Maiden, and fictional survivors of Fukushima, for example. But there is, I feel, an ethics to dramatic monologue writing, too, much as there is an ethics to documentary photography, and I believe the dramatic monologist needs to be particularly careful not to engage in inappropriate (even if well-meaning) acts of cultural appropriation and/or ventriloquism of marginalized voices. How does one know if a story is one’s to tell? I don’t have easy answers for this, even with respect to my own work. I do know that respectful engagement is key, along with scrupulous research, as well as listening for a very long time before allowing your characters to enter the page/stage and begin speaking. Review of The Crafty Poet by Christine Swint at Balanced on the Edge. Review of The Crafty Poet by Christina Veladota at Maybesopoetry. 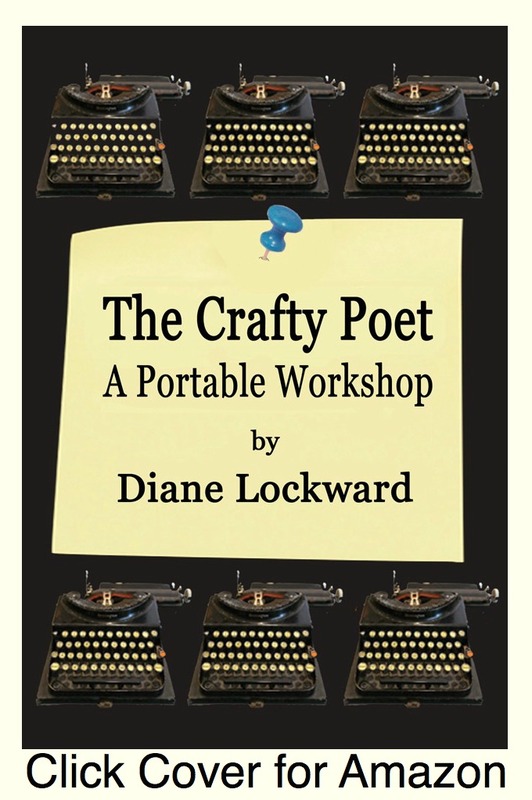 Lynn Domina reviews The Crafty Poet at Lynn Domina, Poet. Carol Berg interviews me about The Crafty Poet in Ithaca Lit. Grace Cavalieri reviews The Crafty Poet in the Washington Independent Review of Books. Now Also Available As an E-Book. Available at Amazon, eBookIt, or wherever e-books are sold. Sunday Poem Feature at Gwarlingo. If you have friends who might be interested in this newsletter, please forward it to them. Copyright © 2015 Poetry Newsletter, All rights reserved.